I'm a sentimental nut.. I wont lie, and when I saw the photo necklaces at Kathy Lo Rocks, I knew I HAD to have one. 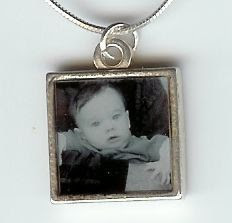 You can choose between several diffrent sized charms, as well as silver, vermeil or gold. The charms can be used on necklaces, bracelets, or really any way you want you wish as well as you can buy them with or without the necklace or bracelet. So really no matter what your budget you can find something that will suit you. All of the charms are double sided so you could get two diffrent pictures or you can choose a picture on one side and a design on the other side. I jokingly refer to Connor as "monkey legs" so I went with a monkey pattern on one side and Connor on the other side. I have rarely taken it off since! They are 100% water proof so bathing, swimming, and showers are Aok with your photo charms (I have tested all but the swimming aspect and we have no leaks to report). My only real qualm is I love my charm so much I wish I would have spent the extra money and gotten a bigger charm! Everyone always is trying to look at my necklace and I'd love to show my baby off even more!! 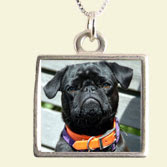 For those fellas out there.. you can buy no better gift than a necklace with the picture of a mom's baby on it.. or even for those without babies.. a dog necklace would be divine or even one of a parent or grandparent! Head on over to Kathy Lo Rocks and check out all the great options! !